Adding one of the best hammocks with stand to your balcony or backyard is an easy way to add some fun and relaxation to your outdoor space! You don’t need to rely on giant trees or intricate knots to hang a hammock! Just hook it to a durable stand, and you can be swinging in the breeze in no time! Before you invest in a new hammock, here are a few features to consider when choosing one for your home! Capacity: The capacity is determined by both the size of the hammock bed and the number of people it can safely handle. 1-person hammocks are compact and fit well in tight spaces, whereas the 1-2 person hammocks can handle more weight. Weight Capacity: Weight capacity is determined by how much weight the hammock frame can safely handle without bending or collapsing. Pay close attention to this safety guideline, especially if you plan to use it with 2 adults on it at one time! 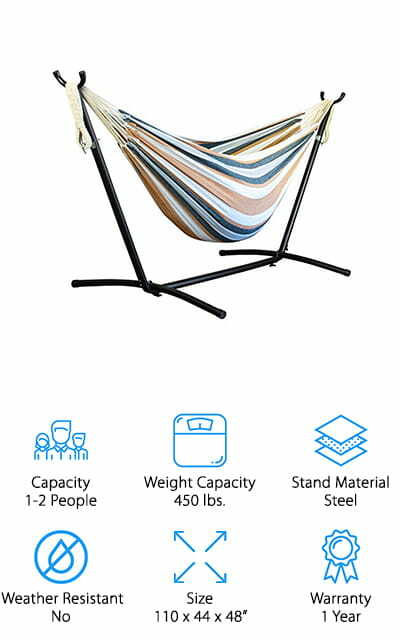 Stand Material: Steel hammock stands are lightweight, durable, and easy to set up anywhere. They also handle rain and temperature changes well. Wooden hammock stands are also durable, and they have a classic, natural look that blends perfectly into your landscaping décor! Weather Resistant: Most hammock beds are made of materials like cotton, polyester, or a blend of the two. We make sure to let you know which ones you can keep outside, and which ones need to be brought in when it rains! Size: The size is important if you plan to use your hammock in a small space, like an apartment balcony or small yard. We tell you maximum length, width, and height so you can find a hammock that fits your space! Warranty: Hopefully you will buy one hammock and keep it for years to come. However, things happen, and it’s good to have a warranty just in case! It’s a sign the company stands by their product, even if something goes wrong! Now that you’re familiar with all the great features you can get in a hammock, let’s get into the product reviews! Our hammock with stand buying guide has a variety of hammocks of different sizes, styles, and prices. You should have no problem finding the right fit for your space and style! If you don’t have time to read about all 10 now, that’s fine! Start with our Top Pick and Budget Pick, and then come back to read more! 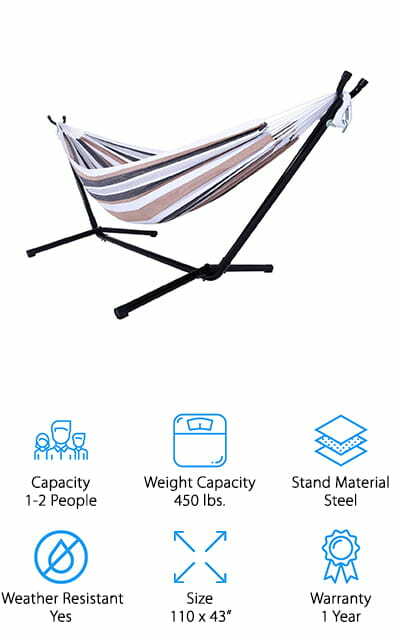 Our top choice for the best hammock with stand goes to the comfortable and easy to set up hammock from Sunnydaze. It’s the perfect size for one adult and holds up to 275 pounds. 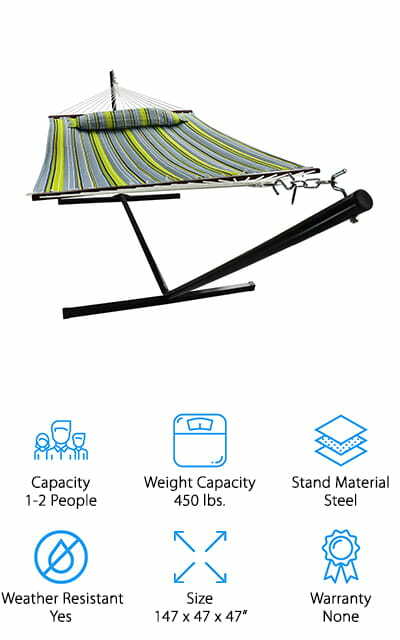 The steel stand is incredibly durable, weather-resistant, and easy to set up, with everything you need to get your hammock up and ready for relaxation! We like that this rope hammock is comfortable and comes with stretching bars, so you won’t fall too far into it if you lie lengthwise across it. It also comes with an additional cushioned sleeping pad, so you don’t have to lie directly on the ropes. This is great for using your hammock in the cooler months because it blocks the wind. You could even use this to sleep on your hammock at night! This set also comes with a matching pillow that is made of the same weather-resistant fabric and stuffing as the hammock pad, which is a nice bonus! We went on the hunt for the best cheap hammock with stand and came across this inexpensive yet comfy 2-person hammock from Best Choice! 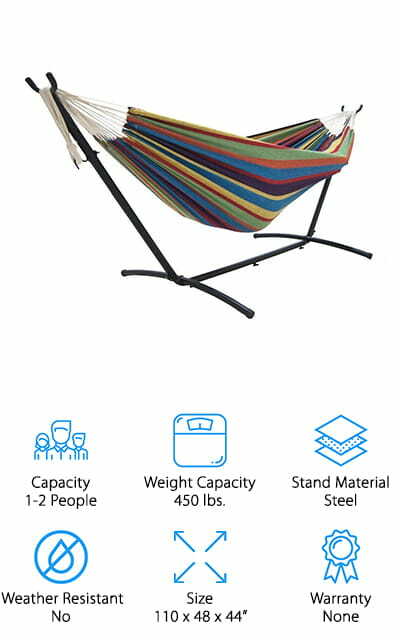 This hammock can hold 1-2 adults comfortably, with a maximum weight capacity of 450 pounds. It’s large enough to sit with a partner in either direction, yet compact enough for small spaces like balconies or patios. We like that the hammock is made of 100% super soft and comfortable cotton, which is machine-washable and comes in 7 different patterned options to match your existing decor. The hammock stand is made of durable resin steel, which is great for using both indoors and outdoors. It sets up quickly, and the stand comes with a carrying case! You can take your hammock to the park, beach, a friend’s house – wherever you feel like relaxing! 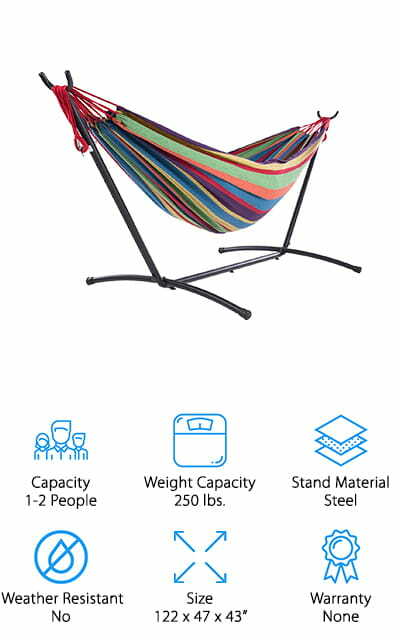 We think this is a great hammock with stand for the price, and would even make a great housewarming gift for friends and family! Next up is this two person hammock with stand from Vivere that is perfect for lounging away the afternoon in by yourself or with a partner! The hammock is made of 100% cotton, which is thick and soft for maximum comfort. To hold it up, the ropes are made of extra sturdy polyester that won’t stretch or tear over time. You can truly customize the look of your hammock, with 21 different combinations of hammock colors and a few options for different finishes on the stand, including black, bronzed, and white! The stand is made of zinc-coated steel that is rust resistant, even if it gets scratched. We like that this double hammock is easy to setup and tear down, and it comes with its own canvas and leather carrying case for convenient storage and travel. If you want a double hammock with a classic, modern, or nautical look, Vivere has one to suit anyone’s personal style or décor! If you want an inexpensive double hammock with stand, definitely consider picking one of these up from SueSport! This hammock kit comes with everything you need to get your hammock up and ready. It has a 100% cotton hammock that can easily handle 1-2 people. The stand is made of rugged, powder-coated steel and can hold up to 450 pounds. It’s also easy to set up and tear down, and the joints are easy to tighten up to prevent the stand from shaking while moving around in it. We also like that the stand is adjustable, which can accommodate a different hammock if you want to update or swap out the original. The kit also comes with all the hooks and chains you’ll need to hook up your hammock and a carrying bag to easily transport it wherever you want to go! This is a great hammock to take with you to the park, or set up on your balcony! 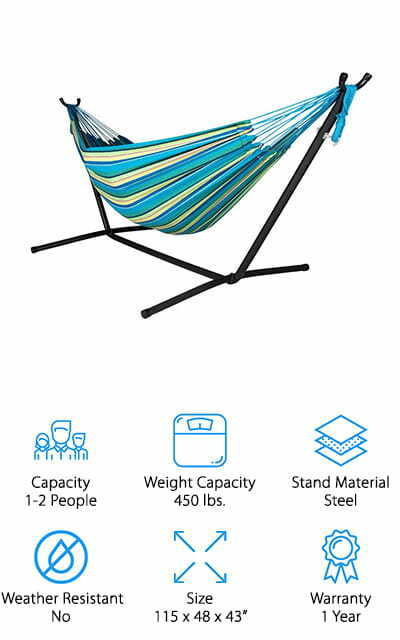 This double hammock from Lazy Daze is great to take on your next trip to the beach! The hammock is made of durable canvas, which holds up well to the elements and can be machine-washed and air-dried to keep it looking like new for years. The hammock comes in 9 different colors or patterns, so you can find one that matches your home décor or personal style! 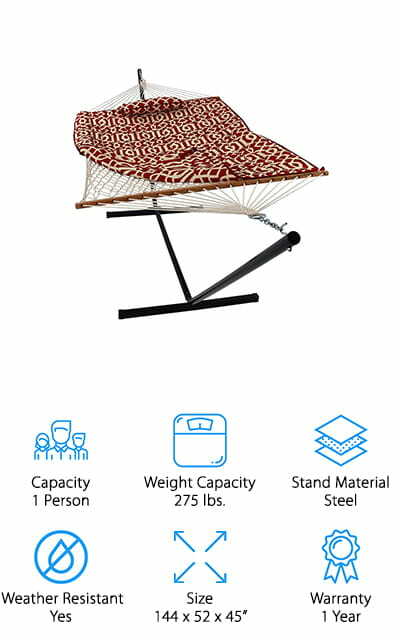 It even comes with a long pillow that fits well into the hammock, and is long enough for two people to use. It’s perfect for using alone or with a partner, and it can handle up to 450 pounds. We like that the steel stand is easy to assemble, without needing any extra tools to set up or tear down. The stand breaks into 5 pieces, and it fits easily into the carrying bag that comes with it. Take it to the beach or move it around your yard for some added relaxation! For a lazy afternoon under the sun, or sleeping under the stars, this hammock from Sorbus is comfortable and relaxing! The hammock is made for 1-2 people, and with the wooden stretcher bars, you can enjoy reading a book or eating a snack alone or with a friend, without worrying about falling into the middle of the hammock! We like that the hammock made of heavy-duty cotton that is weather-resistant, machine-washable, and treated with a UV protectant coating to prevent the vibrant colors from fading over time. This set even comes with a matching pillow that’s long enough for you and a buddy to use together! The stand is made to handle up to 450 pounds, and is easy to set up without any extra hardware needed! It can also fit hammocks from 9.8-12 feet long, so you can swap out different hammocks if you’d rather have a one-person hammock or just switch up the color for a new look! Looking for the best hammock and stand to take with you for a chill day at the beach or the park? This double hammock from Driftsun is perfect for throwing in the car and taking to your favorite spot to watch the sunrise or sunset by yourself or with a friend! The hammock is made of 100% cotton, which is soft and cozy for cool nights on the beach and is easy to machine-wash and air dry if it gets sandy or wet. It’s made to fit 1-2 people and can hold up to 450 pounds. The steel frame doesn’t require any tools to set it up, and it comes with a carrying case to make getting it from your car to the beach a breeze. The best part? This whole hammock only weighs 26 pounds! No worries about dragging around a giant, heavy bag along the beach. You can easily toss this lightweight hammock over your shoulder and go! 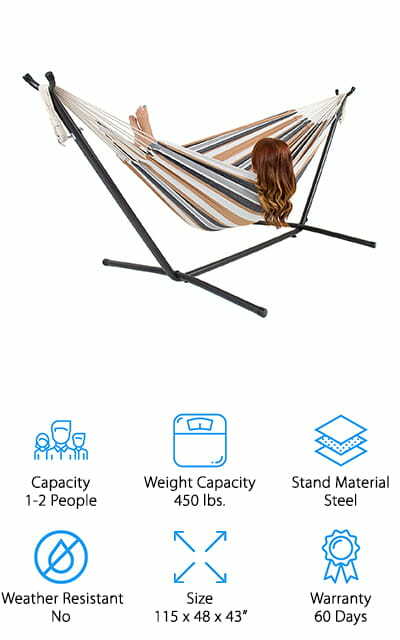 Another great option for a double hammock with stand is this adjustable model from OnCloud! The frame is a piece of cake to set up because it doesn’t require tools, and the knobs are easy to reach for easy setup or teardown. We also like that the universal fit frame is easy to adjust to any hammock that’s 9.5-11.5 feet long. Each end has 6 holes for you to adjust the height and tension of your hammock, so you control how far off the ground you go! It’s also made to fit 1-2 people and up to 450 pounds, so it’s great for swapping in different sizes and styles safely! The hammock is a poly-cotton blend and comes in 4 different colors to suit your style. We also like that the whole thing fits neatly in a travel case, making it easy to store in the off-season or take with you to the beach set up on your balcony! Do you want a one person hammock with stand that looks as luxurious as it feels? 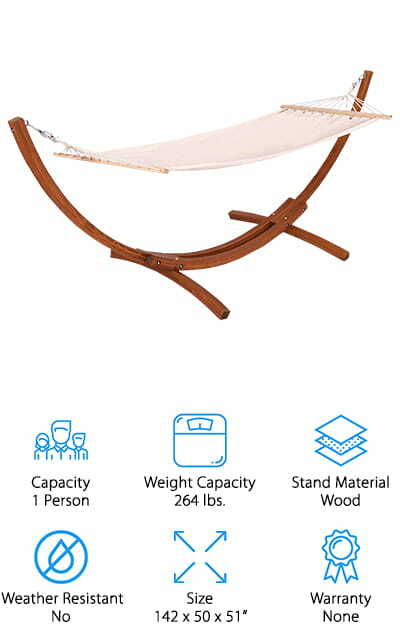 This wooden hammock from Giantex will look beautiful on a balcony, patio, or in your backyard! The wooden stand has a natural curved design that looks far more expensive than it really is, and can hold up to 264 pounds with ease. It’s perfect for one person to relax by the pool, or lounge away the day with a good book and glass of wine. The hammock is made of an off-white poly-cotton blend, which has a minimalistic and luxurious vibe to it. The wooden stretchers keep the hammock stretched flat, so you can lie on it without sinking in too far. You could also swap this hammock out with a wider one if you want more space to stretch out. If you want a budget-friendly wooden hammock to elevate the look of your outdoor space, this hammock is a great place to start! Last up in our hammock reviews is this lightweight hammock built for two from SUNCREAT! 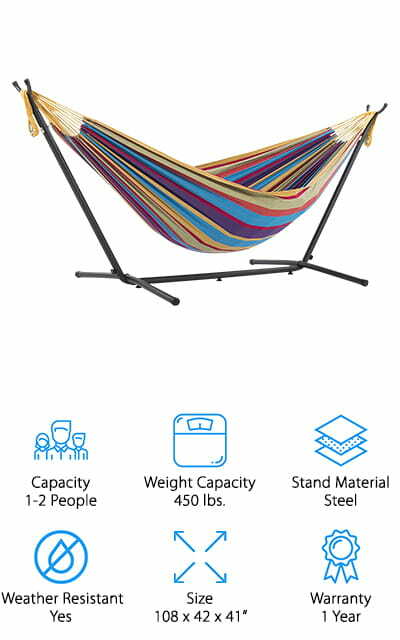 This hammock is built for one person or a couple small adults, and it can hold up to 250 pounds safely. The stand is also adjustable, with extra holes on each side to raise or lower the hammock level to make it easier to get in and out! You could also swap out the hammock that comes with it for a smaller one-person hammock or a fun new color. It’s made of rust-resistant steel, so it’s fine to leave it out in the rain or set it up on dewy grass. The hammock is made of soft cotton, and the vibrant striped pattern has a fun, tropical look to it. We like that everything breaks down easily and fits into a convenient storage bag for transporting to the beach, park, or wherever! It also only weighs 28 pounds, so it’s super easy to carry around!